The year 2018 brought us another installment of HALLOWEEN. This time, bringing back Jamie Lee Curtis and ushering in a new generation to the Shape that is Michael Myers. And, to be honest, aside from the series having 11 entries, newbies to the series can jump right into this film and have a good time all the same. I wouldn’t advise that, but you can do it! I can think back to the Blu-ray for GET OUT (also a Universal/Blumhouse production), which had a potent mix of features and a dynamite feature-length commentary by Jordan Peele. The special features on this thing are a bit standard and lacking. There is a mix of deleted scenes that were, thankfully, cut from the film, and a few dinky featurettes on Ms. Curtis’ return, Mr. Carpenter’s score and the legacy of HALLOWEEN. Now that you have finished yawning, let’s move on and watch these anyway… you know you want to. Jamie Lee Curtis reprises her iconic role as Laurie Strode in David Gordon Green’s “lega-sequel” HALLOWEEN. Courtesy of Universal Pictures. No Audio Commentary? How are you not going to get David Gordon Green, Jamie Lee Curtis and John Carpenter in a room and watch this movie together? Opportunity wasted. Deleted/Extended Scenes: Deleted scenes are typically cut for a reason – for tone, brevity, or some reason unbeknownst to the viewer. These seven scenes run a total 13 minutes and are pretty much what you could expect; however, they could have been explained a bit further by David Gordon Green on a short commentary track. Fans of franchises want more content and explanations. I don’t necessarily need to know the background behind the hanging dog or Laurie’s extended shooting range sequence; but just give us the content, you cowards. Maybe they are holding out for subsequent releases. Lord knows the original has a dozen or so under its belt. Back In Haddonfield: The Making of Halloween – If you want to hear David Gordon Green talk about seeing the original movie when he was 12 and how he loved bossing around the nightmare man, or producer Malek Akkad talk about crazy pitches, this is the feature for you. However, it’s only mildly interesting, despite showing that teenager who was impaled on a fence. The Original Scream Queen: A look into Jamie Lee Curtis’ return to the franchise. I mean… we’ve heard this dozens of times now. We still love you anyway, JLC. The Sound of Fear – The great one, John Carpenter, comes back to create a score with his son Cody Carpenter and engineer/musician Daniel Davies. The score may be the best element of the film, and these three guys found a new take on an iconic sound. Sure, we get to see Davies playing a guitar like a violin, but that’s the only taste of greatness we get on this little vid. The Journey of The Mask – This had one of the best masks of the entire series. So yeah, this featurette is pretty groovy. It has a deteriorated look and, yet, it’s blank and expressive. I love it so much. The Legacy of Halloween – Hmmm… I think you already know this story. 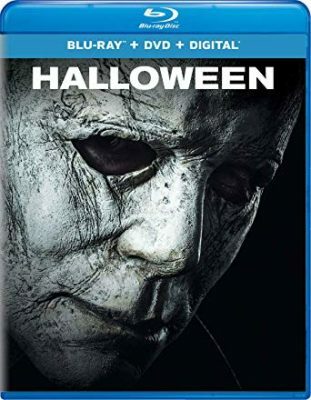 HALLOWEEN is available on 4K Ultra HD, Blu-ray and Digital HD today.